PHUKET: Traffic on Thepkrasattri Rd will take a hit before year’s end with construction of two flyovers to commence just before Phuket’s next tourism high season. The U-turn flyovers (inset) aim to alleviate mile-long tailbacks on Thepkrasattri Rd (main photo). New Phuket Highways Office Director Patiwetwoottisak Sookki confirmed to The Phuket News this week, “Construction will start soon, before the end of this year. “The contract bid has been approved already, with CC Machinery and Construction Limited Partnership, from Nakhon Sri Thammarat province, selected to perform construction,” he added. The two flyers, together costing about B200 million, will both be “mid-air U-turns”, allowing traffic heading northbound to return southbound unimpeded, and without causing delays to other motorists. One flyover will be located near the Jeeteng mansion on Thepkrasattri Rd in Koh Kaew, about 1.38km south of the Heroine’s Monument. The other will be at the Nai Yang turn-off on Thepkrasattri Rd, about 3.3km north of the main intersection in Thalang Town. Mr Patiwetwoottisa acknowledged that the government contract had yet to be signed, that the budget had yet to be handed over and that final approval had yet to come from the Transport Ministry, but was adamant that construction will start “after October or November”. “Both flyovers were approved at their third public hearing on February 18, 2016. Now we are just waiting for the Ministry of Transport to approve the contract,” he said. 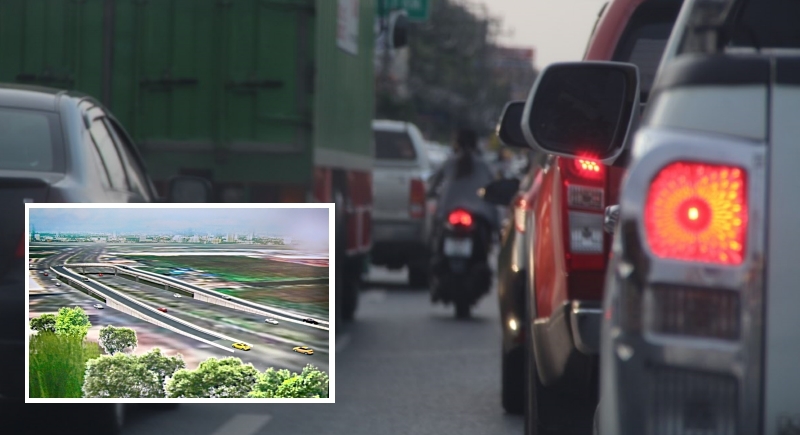 The Thalang flyover will be 640 metres long, with the elevated section spanning 335m, while the Koh Kaew flyover will be 550m long and an elevated section spanning 315m. “The project will need an extra 10 metres of land on both sides of each flyover, but compensation for land expropriated for both flyovers is not included in the budget,” Mr Patiwetwoottisa said. A completion date for either flyover has yet to be set. “These flyovers will solve traffic jams as there are too many vehicles causing long tailbacks at U-turns along Thepkrasattri Rd,” Mr Patiwetwoottisa said. Joe12, once again, you twist things around, go back and re-read EVERYTHING, you have again failed to understand comments, they were raised by Kurt,  to justify flying instead of going by road, do you forget so easily. You seem to read only what you want, next time understand the whole discussion. Rorii...using schoolboy maths and latitude and longitude, the distance to fly from Bangkok airport(Suvarnabhumi) to Hau Hin is 148 kms (or rounded to 150 kms). Good luck in trying to prove science wrong. Joe12, at least Kurt knows how far Bangkok airport(Suvarnabhumi) is from Hau Hin, if they use you directions, ie northings and eastings, they would drive through, over or under the Gulf of Thailand. Once again, roads do NOT go in a straight, level, line. "good luck in trying to prove science wrong!" Yes, Chalong Tunnel Rat. Now first finish that Samkong Underpass debacle. Than as PN reported 21 Aug 2015, it is now time to start that Patong tunnel, promised to start NOW! Would like to know why construction Patong tunnel  not starts now. The company who makes the Samkong underpass it the company to make the Chalong underpass. Christy...nah...it's the expats according to Kurt. But then again it's hard to understand what he is talking about. Bit like you really. Glad to hear it, sort of. Those sudden right lane closures to allow a widened U-turn  are a real hazard, although I notice about half the drivers still stop halfway through the maneuver despite given a full two lanes-as if their depth perception is lacking,....also. Wonder if that's tied into the under developed frontal-lobe syndrome I've observed in many locals. Mmmmmm. Construction will start AFTER October, but soon. Is that the same 'soon' as the Chalong Underpass ( 'started' last October) at where not a single underpass digging is done? Just drainage renewing. And compensation for land expropriated for both fly overs is not included in the budget? Same as Around Chalong circle? And contract not yet signed? again a lack of forward thinking.. what is needed is not 'easing of  traffic flow' but a reduction in traffic.. this means a clean, reliable and viable public tramsport system and not the pie in the sky rail-link currently being touted..